The clip in hair is great! I can't wait to install. 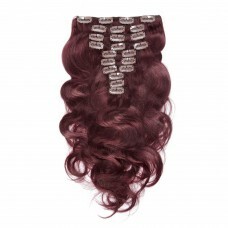 The bundles are nice especially the ends of the hair! Great Job!!!! I loved my package and I really was satisfied with the outcome. I really appreciate it. Thank You!!! 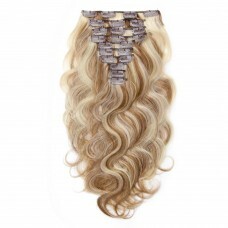 Excellent clip ins and very nice full texture. There was a lil smell.Very good communication thank you. Beautiful color!Love them so much!And they match with my own hairs perfectly! First time with extensions and I love them! I have thick dark Asian hair (which is a bit lightened from the sun) and this color works perfectly. Comes with many clips and half the time I don't even use all of them. I've recently cut my hair shorter and these extensions give me back the length I use to have. 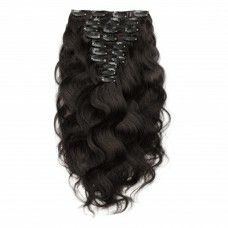 I just installed my clip ins about a week ago and they are amazing I love them. They are very soft and blend very well with my hair. I will order again!! Q1: What color do I choose? Q2: Does the hair have the color difference? A: Please understand due to different color settings of each monitor, pictures may not reflect the actual color of the item. All pictures were taken by ourselves, the hair you'll get is just as following pictures show. 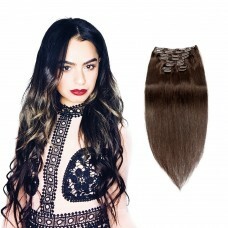 Q3: How to Easy Install clip in hair Extensions? 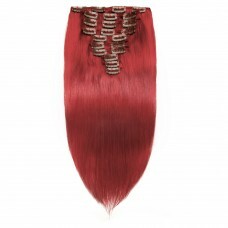 Q4: Can I color my hair extensions? 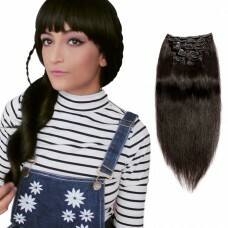 Since the hair extensions are made of 100% remy human hair, they can be dyed a darker color or toned by a professional hair colourist. But we don't recommend you to color it. You can buy different color to wear. Q5: How can I style the hair extensions? A: Since the hair extensions come straightened, you may need to wash it before curling to help it hold curl longer for the first time. 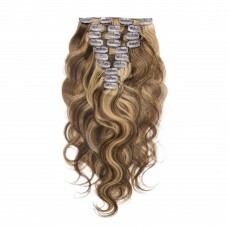 Besthairbuy Clip Hair is real human hair and can be flat ironed, curled, blow dried or air dried just like your own hair. You can also use styling products on Hair, but keep in mind that use of heat styling and products will cause damage to your hair extensions over time. Do not leave on heat for extended time periods. Q6: How do I take care my hair? A: After the hair cut from a donor, the nutrient transport was cut off, so you need to take care of it. You can click: How To Take Care. Q7: How long does the hair last? A: This hair can last for a long time depending on how you maintain it, the better you take care with them the longer they will last. 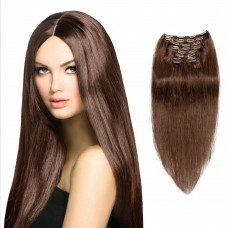 If you take good care of your hair it is common for quality extensions to last up to twelve months. If not treat with respect they will need to be replaced every three to six months. Q8: If I am not satisfied with the hair, can I return it?